Who cares about Sun protection you might say or probably "I don't go out much, so I wouldn't need a Sunscreen at all". But let's debunk that myth. It has no bearing if you go out or not but we are continuously exposed to UV rays everyday even at home. Yes, you read that right. EVERY DAY AT HOME. So, UV rays main and biggest source is the Sun, however you can still get exposed to UV radiation from incandescent and fluorescent light bulbs of unknown brands, and even from glass windows at home. So Suncreen is a must for everyone. But sometimes, the sad part that it's so hard to use sunscreen under make up or it can be heavy, greasy and sometimes causes an unsightly white cast which is horrible for your selfies. Althea has the answer for you, the Petal Velvet Sunaway which is a lightweight, moisture filled with sebum control Sunscreen. When applied it gives you a petal-like finish. You get the key ingredients of Damask Rose Extract, which hydrates and soothes your skin to leave it fresh and healthy, Hyaluronic Acid, which is a humectant to prevent skin dehydration and Geranium Oil, which gives you a radiant boost and heals acne. Using the product under my make-up, I did not experience it oiling up and it felt very light to use. The smell although gives-off a scent of rose petals, it does not linger to the point of being annoying. 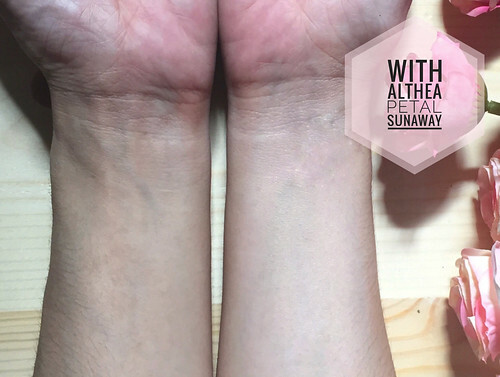 Looking at the comparison image below, the left arm is bare and the right is with Althea Petal Velvet Sunaway applied. As you can see, it serves as a nice base for foundation and/or powder especially if you use the Althea Petal powder. 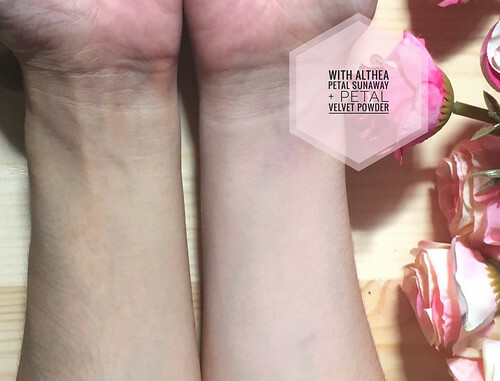 Althea Petal Velvet Sunaway has SPF of 50+ (Sun Protection Factor) and PA++++ (Protection Grade of UVA) - you can be sure that you will get all-day protection. 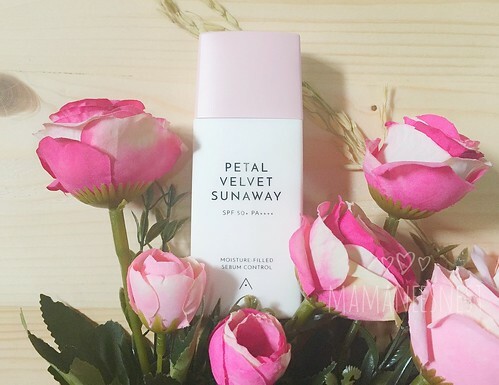 Shake the bottle of the Althea Petal Velvet Sunaway Sunscreen first, then get a pea size amount on your finger tip and apply all over your face and neck. Best to use with the Althea Petal Velvet Powder. Purchase your own Althea Petal Velvet Sunaway Sunscreen here today and get 20% off your first purchase using my link!